Enable students to understand the dynamcs of financial management, its basic elements and management tools. 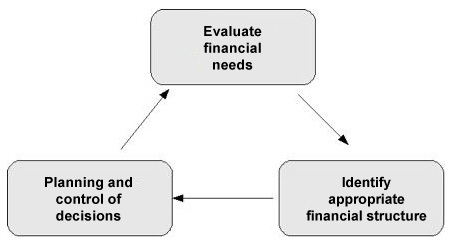 Decision-making processes for financial management. Working Capital and the management areas that contribute to it: inventory, merchandise credit, supplier credit, liquidity. Bank credit, terms and settlement. Evaluations for deciding how to use financial resources in excess. Objectives of cash flow management. Relationship with banks and buyer-seller relations. 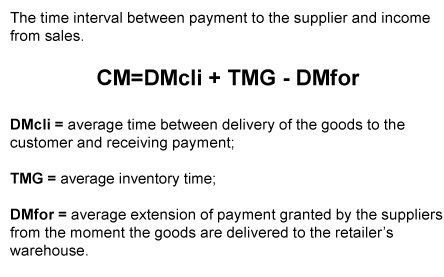 Financial lever and stock management. Financial effects of competitive decisions. The financial manager and the credit manager. Intrinsic liquidity: liquid company assets and liabilities, and those that are liquidable within twelve months, are considered part of the working capital. Functional liquidity: includes only those resources that are considered necessary for smooth running of operations (purchasing, processing, sale). Retail companies make many “speculative” purchases which causes a surplus of goods in stock. The justification for this is the chance of much higher than average returns on these goods, through inflationary or exceptional price increases. Three main classes of goods are identified. First class goods are ones that need constant and careful checking (20% of the total); for second and third class goods, less sophisticated management techniques can be used. Seasonal, “speculative” or recently referenced articles can be found in any of these classes and this makes it difficult to apply specific management techniques, especially if the analysis involves looking at sales over the year. preliminary investigations regarding the credit worthiness of the applicant. granting of the credit and negotiations on terms and methods of payment. follow-up and collection of overdue credit. collection of disputed debt (unsettled debt). unlimited credit is generally granted to public organisations and companies with a solid reputation and good financial standing. 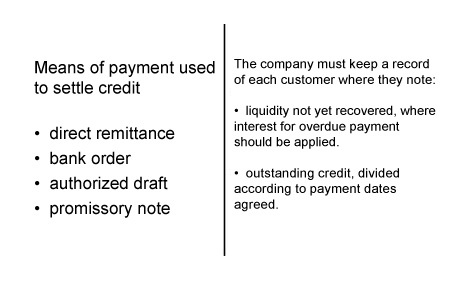 Correct and effective management of payment debt contracted with suppliers has a positive knock-on effect on financial management, as it reduces the need for cash to finance running costs, and on business management, because the company is then in a position to negotiate better purchasing deals or delivery times or to request promotional support. Retail companies often have liquid resources in excess and these can be used to: change their debt position, make easily-liquidable investiments, invest in “speculative” goods. Borrowing is not very popular with retail companies, though it is increasing as competition tightens. Financial leverage is becoming more common because it enables retailers to get cash discounts from suppliers. It gives rise to financial buyer-seller relationships downstream from the business transaction, improving revenue if they manage to negotiate better price deals than they get from suppliers. to set limits to credit exposure.